Moving beyond the market need not mean turning back the clock to a highly centralised state-run model. Mark Serwotka is quite right: the profit motive has no place in our public services, and the case of Iain Duncan Smith’s work programme is a perfect illustration of why. Deteriorating quality, ill attention to the needs of vulnerable people, poor value for money: the National Audit Office’s report on the work programme tells a familiar story of the failures of the private sector to secure public goods. Successive governments have pursued a public services agenda based on market competition, consumer choice and outsourcing to private providers, promising better quality, more responsive services at lower costs. But these benefits have not materialised. Power has been concentrated in the hands of a few supremely wealthy private providers. Pay and conditions have declined, with knock on affects for service quality. And a recent survey of 140 local authorities across the country showed that the majority are bringing services back in-house or considering doing so, mainly because of rising costs and declining quality. This should come as no surprise. Market competition tends to lead to fragmentation and opposition between stakeholders, discouraging the partnerships and holistic thinking necessary for joined-up and preventative services. What’s more, private companies are legally obliged to prioritise shareholder-return, a goal not easily aligned with broader public policy priorities such as meeting social need. The market has failed public services. But what is the alternative? On the work programme, Mark Serwotka suggests taking services back in-house. This is, surely, a good start. But what should in-house services look like in the 21st century? The neo-liberal agenda of marketisation and outsourcing took hold, partly, on the back of a particular critique of state-run services as top-down, inefficient and out of touch with people’s needs, knowledge and preferences. While there is every reason to oppose the neo-liberal solution, it is true that the post-45 model of public services often afforded little power or control to frontline staff and citizens, with power largely residing in the hands of Whitehall politicians, civil servants and ‘expert’ advisers. A new discussion paper from the New Economics Foundation (NEF) argues that moving beyond the market need not mean turning back the clock to this highly centralised model. 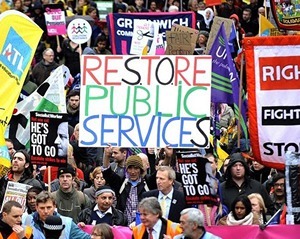 The norm should be for public services delivered within a re-vitalised and democratised public realm, grounded in public participation, with more power for frontline staff, and collaboration with other not-for-profit community and civil society groups. Some public agencies, across the UK and beyond, are already enjoying the benefits of doing things differently in this respect. Co-production is catching on, seeing services designed and delivered through an equal partnership between professionals and service users. Following impressive results in Porto Alegre, Brazil, more UK public agencies are giving citizens direct control over public spending decisions through participatory budgeting. Councils such as Newcastle have demonstrated the benefits of less hierarchical working cultures that afford frontline staff more autonomy and trust. And Co-operative Trust Schools show how the public sector can work in collaborative partnership with other not-for-profit organisations. However, the coalition government’s programme of austerity cuts and accelerated marketisation has been accompanied by a narrative of increasing local control and citizen engagement in the move ‘from Big Government’ to the ‘Big Society’. So how is our agenda different? Firstly, we need redistribution alongside devolution. This means central and local government action to tackle inequalities within and between regions. Meanwhile, a slow and steady move towards a 30 hour working week, alongside measures to address low pay, would ensure that people have the capacity to partake in this kind of ‘everyday democracy’. Finally, NEF’s research shows that public spending reductions are decimating local services and, despite recent claims of the coalition, the cuts are undermining our chances of a lasting economic recovery. We need an end to austerity and a new macroeconomic strategy based on government investment, including in our public services. Amidst a steady onslaught of high profile scandals of private provision, it has become difficult to extol the virtues of free market entrepreneurialism as a driver of public service quality and innovation. Indeed, recent polling conducted for campaign group We Own It shows that just 21 per cent of us trust outsourcing companies (in comparison to the 79 per cent of us who trust the NHS). The tide might just be turning against marketisation and outsourcing. But there is a need for fresh thinking on what should come next. NEF’s new discussion paper suggests one direction of travel – shifting power towards citizens and frontline staff – but other ideas are out there. Join the debate in the comments box below or on Twitter, using the hashtag #futurewelfare. Competition and choice is a disingenuous way to provide public services. It suggests we are all in a race to get better than someone else. What we end up with is much less choice or none at all unless you were born on a particular side of the fence. Trickle down economics doesn’t work and never has so with regard to public services you cannot have a market driven system. All that happens is capitalism squeezes the lowest denominator more and more to maximise profits at the top. Eventually your public services are swamped with issues to solve like poor health, poor attitudes poor nutrition, poor housing, poor schooling etc – all costing more and more to achieve what the law requires. The only option then is to change the law to make it fit an extreme capitalist economy – reducing provision. I don’t have any financial understanding or expertise but I see how it affects society because I am down here in it. Collaboration is the only option and it cannot be profit driven at the frontline. As it comes from the NEF, who are hardly a bastion of the right (quite the opposite), it’s a paper worth reading. I’d suggest that Charities and Non-Profit Mutuals have a valuable role to play, and one which doesn’t involve centralist, statist approaches. I know some socialists howl over that, but giving power to local approaches can be a very good thing. Well, given the continued drops in funding mean very few councils are going to be able to afford to run non-statutory services in a few years…this shouldn’t be surprising. Never mind many of the initiatives saved money, they can’t be sustained in the face of, simply, no funding for them. I have a lot of sympathy with this approach but what sort of people want to spend their spare time running public services? That’s not what’s being proposed. What’s being proposed is i.e. charities and non-profit mutual companies be considered rather than direct in-sourcing of currently private-sector out-sourced services. What has probably happened is that government and politicians say they will reduce the cost of government by outsourcing. They then get people to draw up these contacts with the emphasis on this must not fail. The conclusion is that it costs more to outsource, however the save embarrassment, they tweak the contract so it looks cheaper on paper by removing things the in house provider has to do. What we need is more openness of contracts and know they are being compared like for like. If there has been any fiddling and it is discovered that the person who fiddled it is now on the board of said company, then the contract should be pulled and the individual prosecuted for corruption and the company has to pay to bring the service back in house or all cancellation and re tendering costs. Fair point, but he does refer to a 30 hour week allowing people to partake in this ‘everyday democracy’. That’s separate. I’d suggest reading the NEA papers on working hours, but it’s to do with how much work is available today, among other things.